In the previous chapter, it was assumed that Bradley’s regress is vicious. On this assumption, relational internalism fails as a solution to the problem of unity if it gives rise to the regress. But what if this assumption is mistaken? In fact, as we shall see in Sect. 10.5 in this chapter, several philosophers hold that there is nothing problematic about the regress, perhaps even that it is virtuous. If this view is right, there is no motivation for self-relating internalism. The much more ‘natural’ common internalism will do. 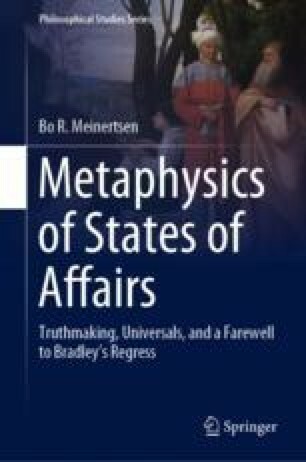 However, in this chapter I shall argue that—in the context of state of affairs ontology, at least—Bradley’s regress indeed is vicious. I shall first review the further context of the problem of unity and relational internalism, and how, as we saw, natural reasoning of common internalism quickly yields the regress. Next, I shall provide a semi-formal analysis of the regress; explain the relevant sense of a regress’s being vicious (an often misunderstood issue); and show in detail that in this sense Bradley’s regress is vicious.